The speaker of the House of Representatives, Hon. Yakubu Dogara, has assured that the National Assembly will introduce legislation that will strengthen corporate governance in Nigeria. Dogara made this known on Friday at the 81st inaugural lecture of University of Jos titled “Nigerian Corporate Governance: From Concentrated Ownership to Dispersed Owenership- Which Way Forward?” delivered by Professor Joash Amupitan SAN of the faculty of law. Enacting such laws has become necessary in view of the fact that corporate collapse leads to loss of thousands of jobs and affects the economy negatively as witnessed in recent years, the Speaker stated. “The factors that led to the corporate collapses that he (Prof Amupitan) talked about in the 2000 when we investigate it boils to the way and manner in which those corporations that failed were managed. As a matter of fact all the problems we traced to corporate governance issues,” the speaker said. Hon. Dogara argued that the challenge still remains whether the proffered solutions are the best way to maintain sustainable, healthy corporate societies in Nigeria is a big question that must be answered but assured that the House will consider passing laws that will check insider abuses that often leads to the collapse of companies. The Speaker who is also graduated from Unijos announced the setting up of an endowment fund by him and his classmates of 1992 so as to give back to the university community. Hon. 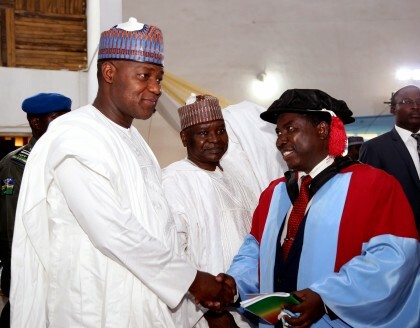 Dogara revealed that the class of 1992 faculty law will later this year hold an event in the university to formally unveil the endowment fund. The speaker also took time to visit the faculty of law buildings where he interacted with staff and students.